The picture shows the trolleybus no. 01I (year of construction 1940) of the German type MPE 1 at the former final stop Westend. The trolleybus no. 01I of the German type MPE 1 was damaged on 25 April 1945 by World War II. The trolleybus was in service again from 15 October 1945. From July 1949 the trolleybus was defective. The bodywork of the trolleybus no. 01I was mounted at a chassis of a truck of the German type Daimler Benz in the year 1950. The engine of the lorry was driven with wood gas. The lorry with the bodywork of the trolleybus no.01I was locally called "Jumbo". 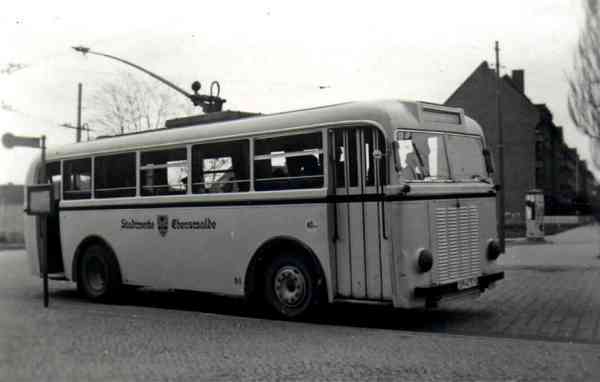 The autobus named "Jumbo" was in service from October 1950 on the line to Nordend. Here a picture of this vehicle. The trolleybus no. 04I was damaged on 25 April 1945 by World War II. The trolleybus was in service again from the 07 August 1945. Following the vehicle was defective for a long time because of missing spare parts. The trolleybus no. 01II was reconstructed from the the car no. 4I by the Eberswalde public utility. It was again in service on 27 April 1950. The trolleybus no. 01II former no. 04I was in use as only trolleybus of the origin series to at the beginning of 1959. This picture show the trolleybus no. 01II former no. 04I of the German type MPE 1 at the old depot Eberswalde/Bergerstraße. The photo was taken on 01 May 1950. This picture show the trolleybus no. 01III of the Czech type ŠKODA 8 Tr10 with trailor no. XII (type W 701, year of construction 1956) at the branch Platz der Freundschaft going in the direction toward Ostend. The photo was taken in June 1968. This picture show the trolleybus no. 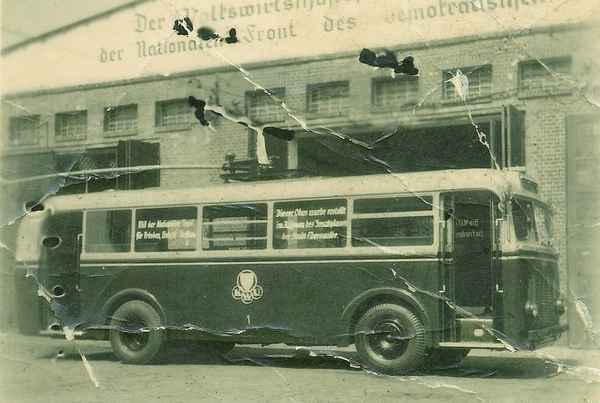 01IV of the Czech type ŠKODA 14 Tr03 at the old depot Bergerstraße. The trolleybus no. 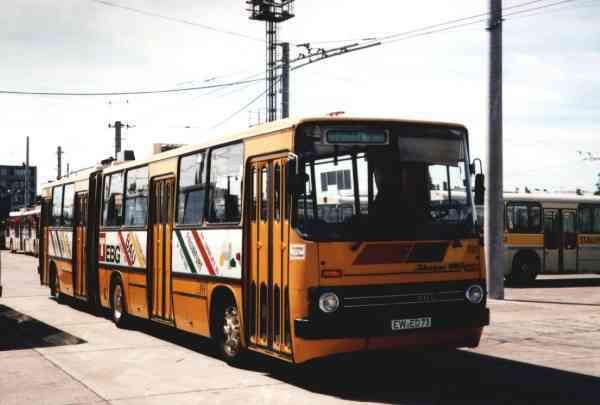 01IV of the Czech type ŠKODA 14 Tr03 was sent to the public utility Potsdam on 22 January 1990. 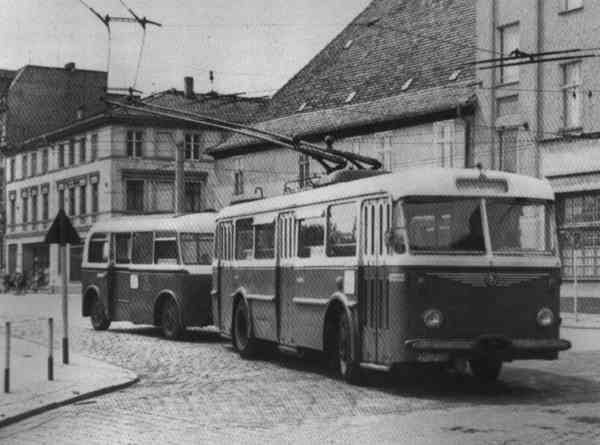 The reason given was that this would reduce the working rolling stock in Eberswalde to one uniform vehicle type, nameley the articulated trolleybus of the Hungarian type Ikarus 280.93. In Potsdam the trolleybus had have the car no. 983. 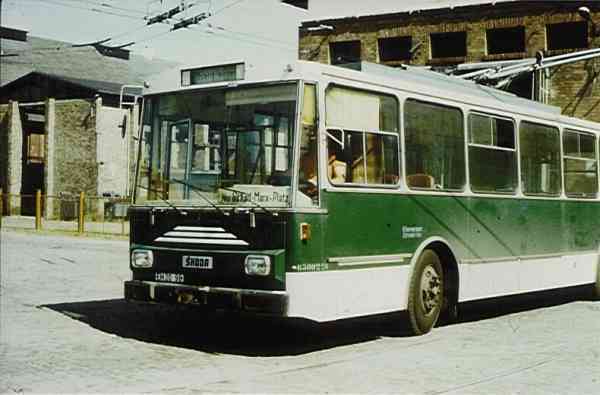 In June 1995 the trolleybus was transferred to Ostrava/CZ and had there the car no. 3221. In April 2001 the trolleybus no. 01IV was sold to Almaty/Kazakhstan. At first the trolleybus had there the car no. 1213, later then the car no. 3048. The photo shows the trolleybus no. 01IV of the Czech type ŠKODA 14 Tr03 with the current car no. 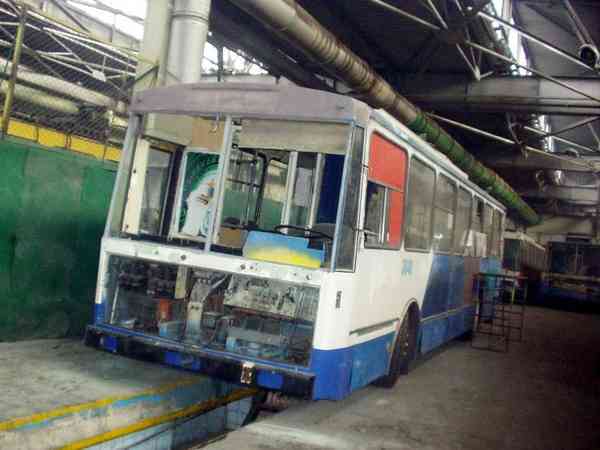 3048 during the general overhaul in the trolleybus depot in Almaty/KZ on 15 December 2004. After the interior equipment was completely renewed, the trolleybus is prepared for lacquering. The trolleybus is probable taken again in use in February/March 2005. The articulated trolleybus no. 01V later 001 of the Hungarian type Ikarus 280.93 came on 20 January 1990 from Potsdam and had have there the car no. 452 later 952. In February 1990 momentary in use with the car no. 9IV. This picture show the articulated trolleybus no. 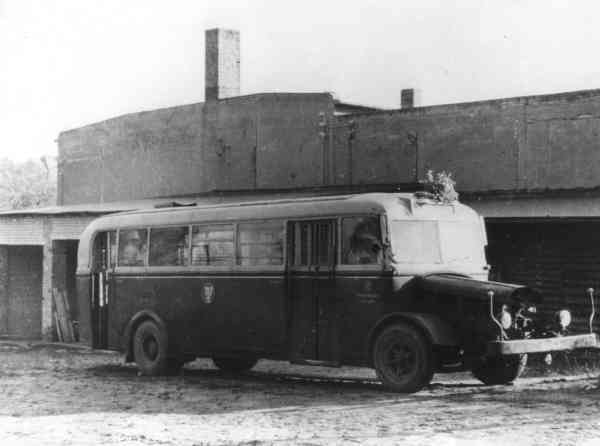 01V of the Hungarian type Ikarus 280.93 at the depot Eberswalde/Nordend. After the mission in Eberswalde the trolleybus no. 001 was transferred on 03 May 1995 to Timisoara/RO and had there the car no. 8. 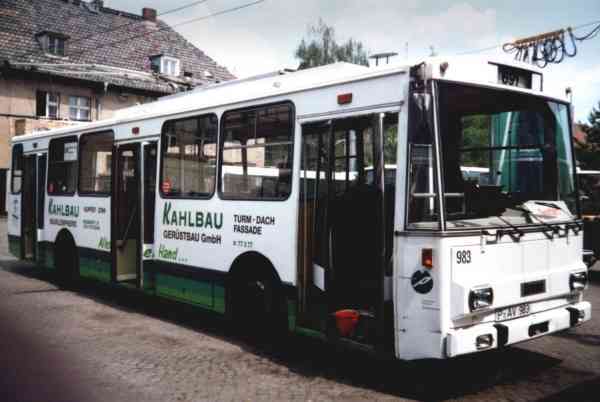 This photo show the former Eberswalde articulated trolleybus no. 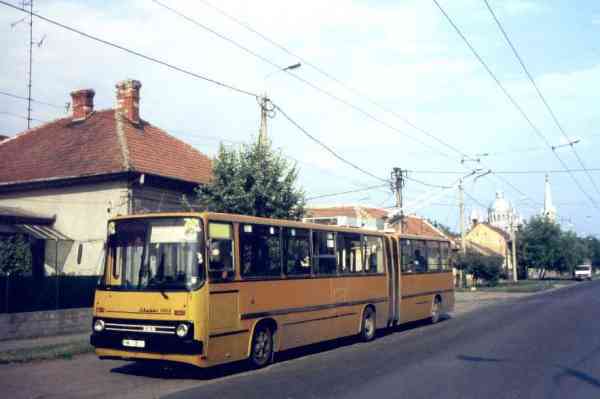 001 of the Hungarian type Ikarus 280.93 in Timisoara/Romania. The photo was taken on 28 August 1996.